Sounds an absolute weapon that H, many thanks for taking the time to post all the gory details here. I wonder why a remote filter was fitted, it's not as though the stock position is difficult to reach. As already said what an absolute beast. Gorgeous car. I maybe be wrong but does the oil filter need to be relocated due to that airbox? Stunning car. I miss my old one sooo much. Could someone please tell me who built this car? That is some fantastic build. I'd love to have engine like that in my car. I wonder about longevity of these big displacement builds though. Can it ever be equal to stockish 3.6? Any idea how many miles now on this particular build? So they have gone the mechanical cam route and ditched the hydraulics then, no wonder it goes so well. Never going to rev to 9000 RPM on hydraulic lifters but I’m not convinced it’s worth the hassle of having to gap check the thing every 4500 miles. The motor should go well past that mileage before needing adjustment, Nick, some of the bikes are checked at 30000 miles, despite revving to 14000+ rpm. 4500 seems to be needlessly early, assuming that on the road, a motor can never be used as hard as on track. I believe that's what the engine builder recommended - probably erring on the side of caution (not a bad thing given what could happen if they do go out of spec!). Of course, the GT3 valves / springs are considerably heavier than the ones in a bike so I'd guess that's also a factor. Even on the standard engine, the springs are very close to being coil-bound on full lift. I believe Richard was being cautious in this recommendation. That the clearances needed adjusting wasn’t cast in stone, but merely his recommendation to keep an eye on things such as maximum revs used, cylinder leakage, and the valve clearances. But another Porsche indy who’s run 996 GT3 R race cars (and yes it is relevant in this instance) was also adamant the clearances on this engine should be checked and adjusted if necessary. Bearing in mind the build cost, the above suggestions sound pragmatic. As for your example of the BMW M3 engine, I think the specific output/maximum rpm of an engine has little to do with it’s valvetrain durability and longevity. I’m sure Mike will confirm that valve train wear has far more to do with cam lift and duration, with as Nick has said the weight of the components within the valve train, those being the valves, retaining collars and rockers etc also being a major factor. Hi Slippy. There are many factors which need to be borne in mind here, principally the design of the ramps at either end of the cam flanks. These serve the purpose of preparing the valve for lift by decreasing the tappet clearance just prior to the actual lift profile becoming active. Of more interest is the closing flank of the lobe and its attendant 'closing ramp', which dictates the velocity at which the valve is re-seated. If this engine runs titanium valves and beryllium-copper valve seats (possible? ), they need to have a bespoke closing ramp to avoid pounding the seats out. A well designed ramp will gently seat the valve, without adding excess duration to the profile. As an analogy, it is akin to feathering the brakes just before a dead stop is reached after some hard braking, thus avoiding the dreaded kick-back due to an instantaneous velocity change. If the engine still runs steel valves and standard seats, the mileage at which they should be checked depends largely on the duty cycle of the engine (the amount of time it spends at WOT, basically), which on a road engine is in single figure percentages. A cup car will likely experience a 45% duty cycle, so typically 8-9 times the road car's. This was why I suggested it should run longer than 100 hours between checks, but Richard was probably wanting to get them checked in order to get a feel for the valve train when running under road conditions, rather than race conditions. The mass of the components should always be factored into the profile design, along with a properly designed valve spring. When properly matched, the inspection intervals should be relatively light. One odd phenomenon can take place with engines that see sporadic use; the clearances can increase due to carbon lifting off the backs of the valve heads , (as a result of moisture being present in the atmosphere), which then drops onto the valve seats, increasing the tappet clearance. Generally, clearances tend to close up rather than increase, but this is one exception to that 'rule'. I would imagine that if Richard finds that there is no change at a all in the clearances, along with minimal cylinder leakage, he will be happy for the motor to go for a longer period before inspecting them again. I get where he is coming from, I built a hillclimb motor in 2010, which due to the short run times, I had no idea of the point at which it needed checking. Fast forward to 2017, the motor came in for a freshen up, all the valve clearances were as the day it left the workshop, despite having its neck wrung at 9300 rpm for the last 5 years at least. That engine should now run happily for the next 7 seasons or so, but the valve train was a total unknown when it was built, in terms of longevity. What a machine! Quality engineering and good taste in spades! Thanks SlippyDiff for the write up, I really enjoyed reading it! But what really brought a halt to proceedings was my dear mother falling and fracturing her hip on November 19th. Though the operation to repair the fractured hip went well, she subsequently contracted sepsis ten days later and fell seriously ill.
My sister I and feared for her life, so much so that I stayed with her overnight on the Thursday 30th November. Large hospitals are strangely surreal places in the early hours of the morning, with only occasion whispers from members of staff checking BP, oxygen sats etc, or offering kindly cups of tea, coffee or sandwiches to break the long periods of silence. But periodically the tranquility is shattered by elderly patients crying or screaming out for help, all of which I found deeply unsettling when your nearest and dearest is critically ill and trying to rest..
Sleep wasn't an option, so I tried to pass the time bringing this review up to date, but also thought it a good way to take my mind off the inevitable. My dear mother passed away shortly before midnight two days later on Saturday 2nd December aged 90. It's 3.30am on a fine Sunday morning in early September, and another pre-dawn alarm call urgently wakes me from my slumber. 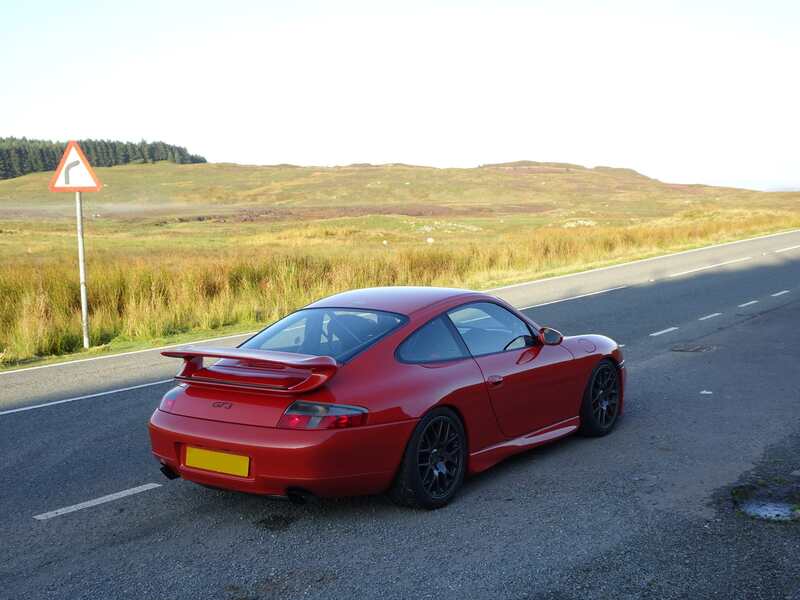 So with the world having fallen out of my bottom I grabbed another two hours sleep before getting up, showering and once again heading up to fine roads of N.Wales to test this phenomenal exercise in 996 GT3 honing. The new owner has had the car three months now, and in that time has clocked up a good few miles. I tend to be pretty generous when it comes to sharing cars (with the caveat I need to feel the recipient of the keys is sensible, mechanically sympathetic, knowledgeable, can "drive" and understands what they're about to drive) and knowing the owner of this car gets emotionally attached to his cars, I felt incredibly privileged to given the opportunity to drive his truly unique and stunning car. I'd taken the time to watch and study him driving the car (and as said previously, he made it look easy ! !) so what came next was a bit of a shock. 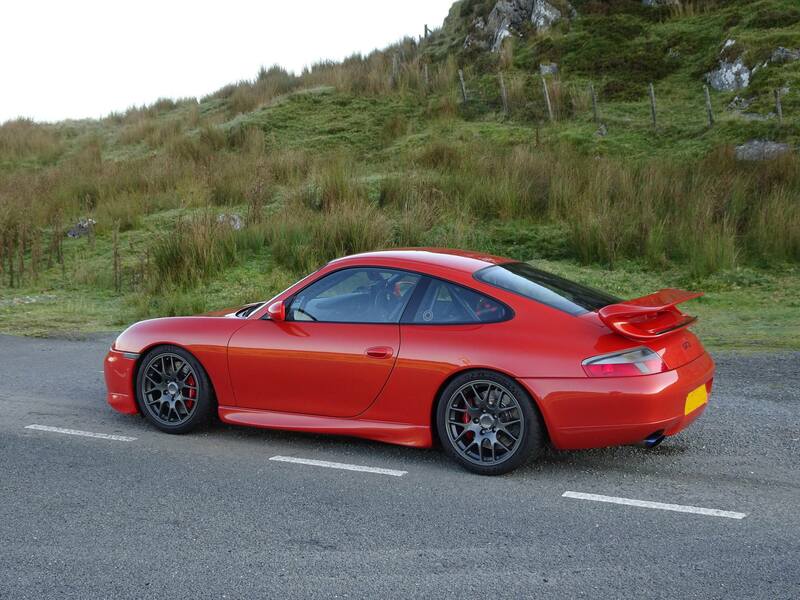 The car has a Cup flyweight flywheel (think 964/993 RS, Mk 1 996 GT3 Clubsport, then remove three kilos more... !!!) the flywheel in itself isn't a problem (I've owned all the above fitted with LWT flywheels) No, what made the process genuinely tricky was the unsprung paddle clutch ie a full race unit more at home in a race, sprint, rally or rallycross car . A paddle clutch has one function, that being to transmit the engine's power as efficiently as possible without any slippage. Period. In reality that means they're not designed for road use or in traffic. They are effectively in or out, and very switch like. 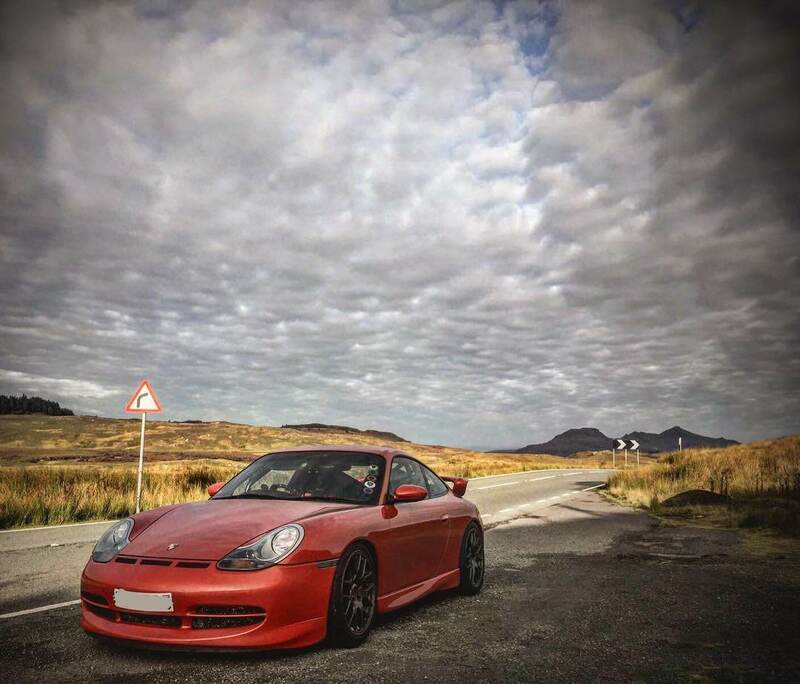 They can be made to last on the road by avoiding riding the clutch when setting off or changing gear, but they're primarily designed for race circuit/rally stage use. So that was the first hurdle to overcome, the next was equally tricky. As I've mentioned before, this car runs some very trick, custom throttle bodies and a Motec management system (not to mention the exquisite carbon airbox pictured) As with most throttle body installs, this one was utilised primarily to liberate additional horsepower and ensure the magical 500hp brief was met. And whilst the throttle bodies are an important part of what is a symbiotic blend of parts (heads, cams, exhaust, engine capacity, and induction/management) they, long duration, high lift cams and large inlet/exhaust ports aren't the perfect solution for a road going car. So whilst this engine and its driveability were perfected after many hours on an engine dyno (not a rolling road) the throttle response low down in the rev range, sub 2k rpm, still isn't perfect. Pair the clutch with this less than progressive low down throttle response AND the flyweight Cup flywheel/clutch assembly and things start to get "interesting" especially for an individual as inept as my good self (actually I once owned an ex Prodrive Impreza WRC car, the second car they built after the one they'd built for the late, great Colin McRae) and that was actually easier to drive once you'd mastered the straight cut 'dog 'box ! ! ! The gearbox itself is a trick item, possibly a 2000 GT3 R or 2001 GT3 RS item (TBC) fitted with a Guard Transmissions (GT) billet LSD and probably a 8/32 crownwheel and pinion (TBC) and an external, front mounted oil cooler. Irrespective of its lineage, it transmits 500 NA horsepower to the Tarmac very, very efficiently indeed. 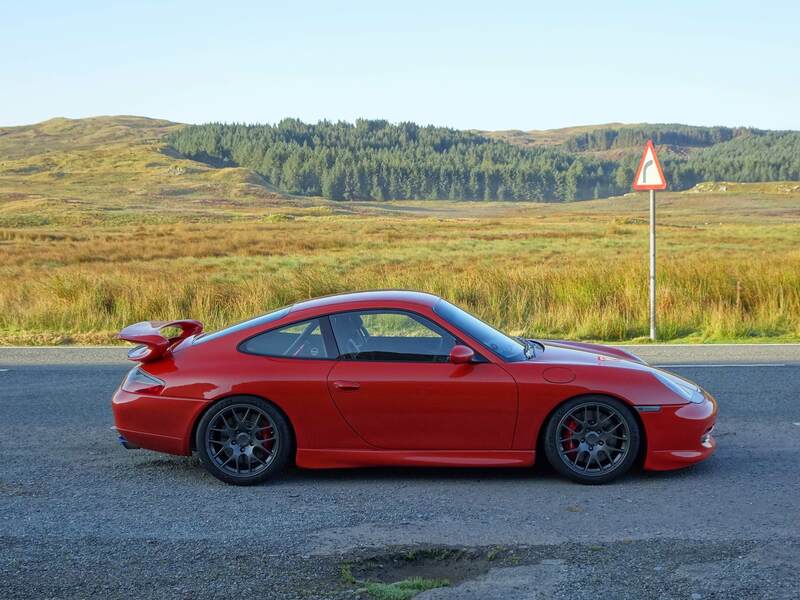 With each passing mile the JRZ dampers have become more compliant, and this along with the myriad rose jointed toe arms, castor arms and track control arms makes for the best handling 996 GT3 chassis I've ever driven. The suspension geo has been tweaked by danny at Unit11 and on Cup 2's in the dry the car goes where it's pointed, end of. When cruising, the intake noise, the mechanical sound of the engine and the transmission (courtesy of the Cup gearchange cables) are more prevalent than any exhaust noise. But don't be thinking this is tiresome overly noisy car to drive, it isn't. Actually that's not true, the noisiest aspect of this car (apart form the induction noise) is those bloody Endless brake pads !! which squeal in protest every time they're used. And whilst there's no doubting their bite, nor indeed their ability to haul the car down from massive speeds with ease, time after time, they are ridiculously noisy. But the ultra lightweight flywheel (and clutch) also impact steady state cruising on low throttle openings, the lack of any meaningful flywheel effect, means the the engine can fall off the cam and when it does so, it can get histrionic. It's straightforward enough to address though, you change down a gear and get the engine revs raised so it's back on the cam. It could be seen as downside, or you can view it as I did, that being it just adds to the car's incredible character. Slippy, firstly may I say sorry to hear about your Mum, that can't have been easy for you and any other family members. Secondly, I can sympathise with you finding a hospital ward to be a lonely, often scary place, having had a fifty one week spell myself back in 1989. The experience was quite sobering at times, but as you've said, it can give you copious time in which to think - very glad your mind wandered to Zanzibar again! Thirdly, another great write up! It's funny, the boys at Center Gravity really rate the 996 platform over both previous and later versions, along with said platform's build quality versus the 997 generation. That opinion was from both Chris and Pete, and it certainly sounds like your friend's car is pretty well resolved. Will the beast be gracing any tracks this year? Would be great to see it in action. Keep up the reports as and when you have driven it again.